In space, no one can hear you scream. ... But as far as I'm concerned, lasers still go "pew, pew, pew" and ships explode in fireballs. That's just how I like it. If you're a fan of space combat between squadrons of fighters, you might want to check out Shadows in the Void. It's the new sci-fi minis game rulebook released by Assault Publishing. After two years of hard work with the help of several fantastic wargaming enthusiasts, I proudly present Shadows of the Void, a unique space fighter wargame. It requires careful planning and the use of cunning tactics – stealth actions, sudden attacks and unexpected traps are keys to victory. In the 90-page rulebook you will find basic rules with helpful diagrams, twelve different scenarios, a random mission generator, and five squadron list, each representing a distinct race. What is more, the book comes with all the necessary counters and cards printed on separate sheets. But there’s more! 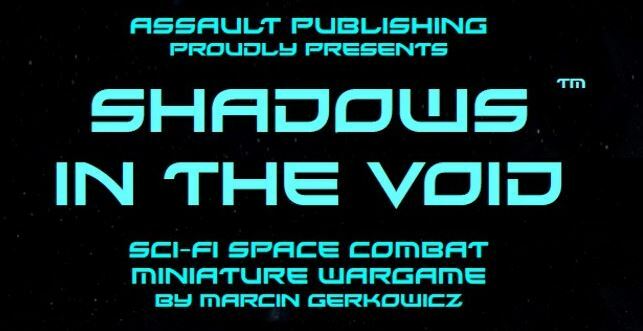 Shadows in the Void is the first Assault Publishing ruleset with a dedicated miniature range. At the moment, it covers all units from two of the five squadron lists, with additional forces in preparation. The metal miniatures are made in 3mm (1/600) scale and are fully compatible with PSF line from Oddzia? Ósmy. You can find more details about the game in this article. The rulebook and the miniatures are available in the Assault Publishing store.